In the product keynote Anthony Deighton touched on Qlik's positioning in IoT and invited Mike Prorock from Mesur.io to the stage for one of the coolest IoT demos I have ever seen. Live on stage was a Mesur.io bulb sensor planted in a small garden… yes a garden right there on the stage! There was a great moment when Anthony was given a watering can and started to water it, Mike showed the Mesur.io app, powered by Qlik Sense, in action. 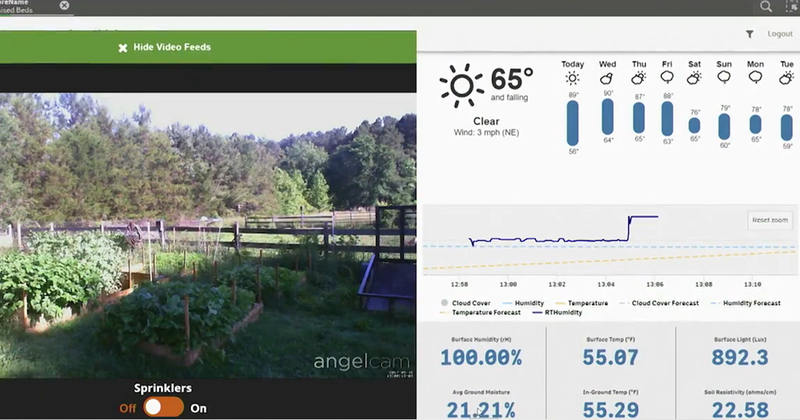 Not only was the dashboard displaying the soil moisture levels in real-time, but also, via a live video feed, it showed how this was integrated into their irrigation system on his farm back home and the fact that it switched off the water sprinkler system to save water. Having talked to Mike since the early days of Mesur.io it was like a #ProudDad moment. Further insights into how Qlik was being used in IoT were dotted about the many breakout sessions. I dropped into my colleague Jeremy Sim’s session on manufacturing and high tech in Asia to hear how companies such as Kyuden have moved from time-based maintenance to risk-based maintenance resulting in minimizing downtime by analyzing data from 84 facilities comprising 100k of equipment. Another company, Scania, gained insights into their trucks’ usage and performance on the road and used it to improve their production process. IoT shined through Qonnections, is this the year of Intelligent Qonnectivity? I also met our customer BTicino, an Italian electrical wiring manufacturer, who talked about how they used Qlik to save 3% on their annual energy costs across their 9 factory locations utilizing their own manufactured smart meters and switches and by analyzing the data from them combined with their production data. Imagine if all BTicino customers replicated similar projects themselves utilizing Qlik with the same components from BTicino, what greater energy savings would be seen across Italy, I wonder? One of the final sessions that I attended was a great example of how Qlik can even be used with Blockchain technology, originating from digital cryptocurrencies like Bitcoin and often associated with IoT. Pomerol Partners talked about how they are using Qlik with blockchain technology as smart contracts using a secure, distributed digital ledger of transactions from multiple parties to streamline often complex and cumbersome processes. When combined with IoT data Blockchain could open a world of possibilities outside the financial sector where transactions need to be tracked and more importantly the status immediately known once completed, think asset tracking or real estate management for example. My main take-away was it’s not just about BIG data but combinations of data. When you think about how Qlik works, IoT data is truly just another data source and the real value comes when you combine IoT data with other data. When the insights gained are shared across the organization is when you will start to maximize the return on your IoT ecosystem. All in all, it was one hell of a buzzing convention and everyone I have spoken to who attended, from customers, to partners and colleagues, all agreed it was the best one yet. I am hoping for an even more Qonnected Qonnections 2018.